The season may be still far from an end, but Fulham striker Luciano Vietto is reportedly on the verge of completing his transfer to a new club. Loaned from Atletico Madrid to the Craven Cottage side for one season, the Spaniard has only scored one goal in English football so far. 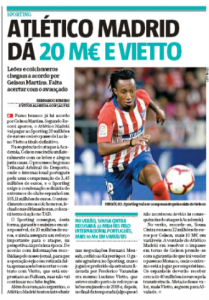 Now, according to newspaper Record, the Colchoneros have offered him in a deal for the former Sporting winger Gelson Martins, something which was already suggested at the weekend. Gelson moved to Atletico on a free transfer in 2018 after rescinding his contract with the Lions. Now as FIFA are demanding the Spanish side to pay for the transfer, Record claims the clubs have agreed a deal where the Lisbon club get €20m plus Vietto. The newspaper says the only thing left for the agreement to be completed is for Vietto to accept the move to Sporting. They state that the 25-year-old ‘is not staying at Fulham’, and Atletico Madrid are so sure of that they’re already sorting his future now. In the end, Atletico Madrid will end up making even more money, since Gelson Martins is currently loaned to Monaco and could move on a permanent transfer worth €40m.